For the love of wine! 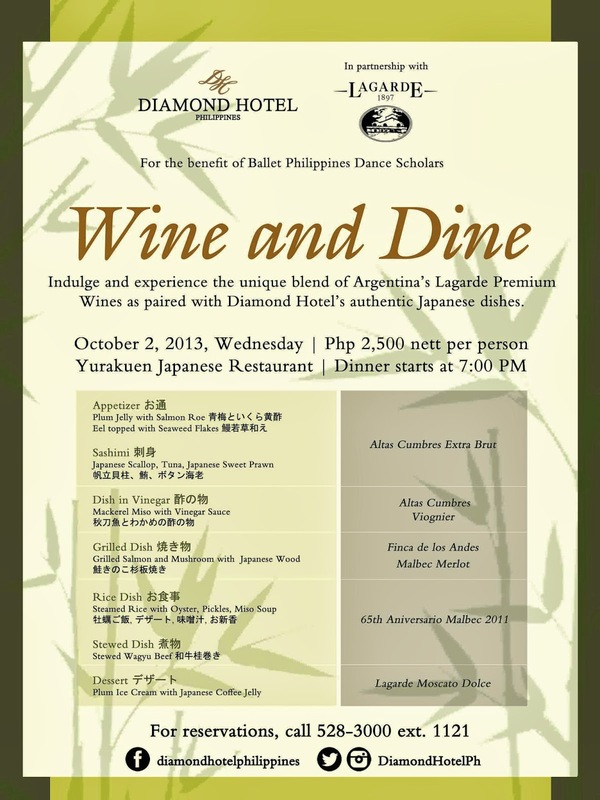 For the discerning who savor great food and wine, what better way to celebrate a cozy evening than an authentic Japanese dinner perfectly paired with fine wines from Argentina. 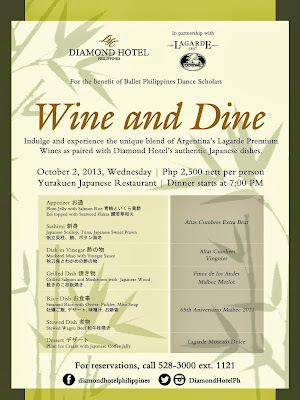 Experience the artistry of wine pairing on October 2, 2013, as Diamond Hotel teams up with Lagarde Wines, to host a seven-course prix fixe dinner featuring a range of premium wines from Argentina. This partnership is for the benefit of Ballet Philippines’ dance scholars. For only PHP 2,500 nett per person, guests can have an ultimate Argentine wine experience complemented by the award-winning, authentic Japanese cuisine. The food and wine pairing selection will be explained and discussed by Diamond Hotel’s executive chef, Marko Rankel and Lagarde Wines’ export manager for Asia and North America, Sebastian Barboza. The chef’s menu starts off with Plum Jelly with Salmon Roe; Eel topped with Seaweed Flakes; and an Assortment of Fresh Sashimi to be served with Altas Cumbres Extra Brut. This will be followed by Mackerel Misowith Vinegar Sauce to be paired with Altas Cumbres Viognier. For the main course, enjoy Grilled Salmon and Mushroom served with Finca de los Andes Malbec Merlot, followed by Steamed Rice with Oyster, Pickles, Miso Soup; and the Stewed Wagyu Beef to be served with 65th Aniversario Malbec 2011. The dinner concludes with Plum Ice Cream withJapanese Coffee Jelly for dessert to be accompanied with Lagarde Moscato Dolce. The wine dinner begins at 7:00 PM. 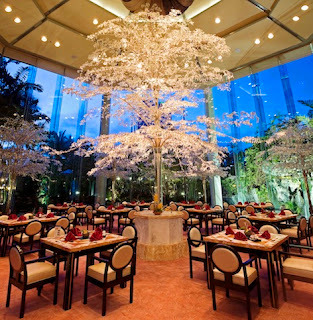 For reservations, please call (632) 528 3000 ext. 1121. Diamond Hotel Philippines is located at Roxas Boulevard corner Dr. J. Quintos St., Manila. For inquiries and reservations, please call Corniche at (632) 528-3000 local 1121. For more information on Diamond Hotel Philippines, please visit www.diamondhotel.com. For hotel updates and special offerings, follow us on Facebook at http://www.facebook.com/diamondhotelphilippines and Twitter at http://twitter.com/DiamondHotelPh.